Is a Marrel Skip right for me? When considering what type of bin you need for your rubbish removal needs, it’s important to understand exactly what features the bin has to offer. 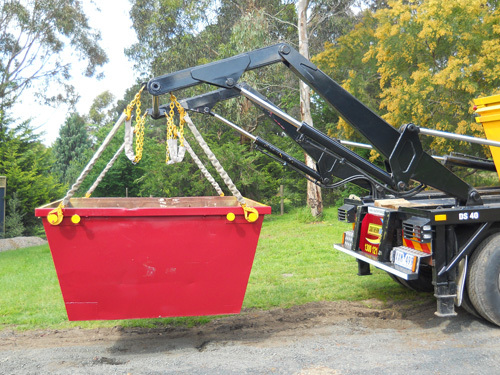 Here at Southern Skips we specialise in Marrel Skips, which are lifted from our trucks using hydraulic chains, and placed gently onto your property. This minimises damage to both your property and our skips, and gives you the option of having timbers placed down for even more protection. All our bins are higher than they are wide, which means they take up less space in your driveway but still have plenty of room within for your rubbish. All our bin from 3m³ and above have a door at one end that doubles as a ramp, allowing for easy access and safe rubbish removal. They are all equipped with reflective corners to avoid injury from passers-by and are painted in our vibrant yellow and red colours to make them visible to cars and trucks if placed on the nature strip. However, because we lift our bins rather than drag them, we need to be slightly more careful about what and how much goes into them. For safe road travel we cannot transport bins that have been overfilled as this is a serious danger to other road users and our drivers. We also cannot lift extremely heavy bins. This is a result of our hydraulic system and to avoid damaging our trucks we will instead remove heavy loads in a number of smaller bins rather than one large bin. If you have any questions or want to enquire about hiring one of our Marrel skips, please contact our friendly staff.